High performance & highly polymer modified pre packed special high quality grey adhesive. It is used for permanent fixing of Granite and Stone application. N. S. A. 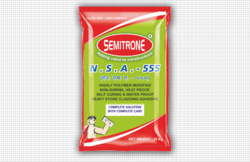 - 555 is a non shrink, heat proof, self curing and highly flexible adhesive having excellent waterproofing properties. It is specially made for Granite, Marble, Stone, Vitrified Tiles flooring etc. It is both for exterior and interior applications.